PRE-ORDER NOW: THIS ITEM WILL BE RELEASED ON 18 SEPTEMBER 2017, BUT YOU CAN PRE-ORDER IT NOW TO BE GUARANTEED A COPY. PLEASE NOTE THAT YOUR PAYMENT WILL BE TAKEN IMMEDIATELY, AND THE ITEM WILL SHIP JUST BEFORE THE RELEASE DATE. What A Disgrace wrote: I assume Harryhausen 1955-1960 will include It Came From Beneath the Sea, 20 Million Miles to Earth, Earth vs. The Flying Saycers abnd The 3 Worlds of Gulliver. And I imagine a follow-up will date from 1961-1964, including Mysterious Island, Jason and the Argonauts and First Men in the Moon. Indicator has all the Harryhausens but Argonauts, as it's already been released. So the other two might just be standalones as they're the more high-profile titles of the set. I'm absolutely and totally unaware of pretty much any of these films but I'm open-minded about what Indicator will be putting together and look forward to more details. I think you're mostly right about the first set, but they might not have Earth vs. the Flying Saucers because after they announced the Sinbad set I seem to remember them saying they had 5 more Harryhausen titles left to do - and seeing as Sony already released Jason and the Argonauts themselves (as Ribs had already pointed out before me), they may just release Mysterious Island and First Men in the Moon as standalone titles. That would be fine by me, since those are actually the two Harryhausen titles I'm most interested in (particularly Enfield's Mysterious Island). Ribs wrote: The latest newsletter from Raygun claims there will by the end of the year be two additional Harryhausen sets after the Sinbad trilogy (presumably meaning that First Men in the Moon and Mysterious Island will be in a box on their own) and that there will also be two Hammer sets in that same time period. I'm hoping that they snatched up Jason and the Argonauts in the interim, to be boxed with Mysterious Island and First Men on the Moon. Has it undergone a 4K restoration like Sinbad? Isn't Jason one of the HMV Special Editions? More likely they'll get Earth vs. the Flying Saucers before Jason and the Argonauts, simply because - as Dr Amicus points out above - it was recently released by Sony themselves as part of the HMV Premium Collection. But yes, since both have already been released by Sony in the UK, it could be that the third box set is just a two-pack of First Men in the Moon and Mysterious Island, which I'd actually be quite happy with and more likely to buy. Indicator saying on FB the third Harryhausen set will be three films, with a "big surprise." Ribs wrote: a "big surprise." A movie not related to Harryhausen. Sinbad and the Eye of the Tiger with the real most recent transfer? Ribs wrote: Indicator saying on FB the third Harryhausen set will be three films, with a "big surprise." A little pissed off if it's Jason and the Argonauts as I literally just bought it (Sony released it themselves as an HMV 'exclusive' just a few months ago). Could instead be The Valley of Gwangi, which would be a pretty big surprise in that it's from Warner Bros - obviously few labels have managed to sublicense from that particular studio. Indicator did say they had arranged a deal with another rights-holder, so pretty good going if they did get a limited deal with Warner Bros. If true, I imagine they'd leap on a handful of Warner Archive titles and other UK debuts, but obviously with in-house encoding, plus new extras and booklets. "The framing is a bit suspect, as the titles are so far off center as to make the left extreme of some of the credits go off screen." Indicator isn't releasing Earth vs the Flying Saucers - it's already out on a UK BD. 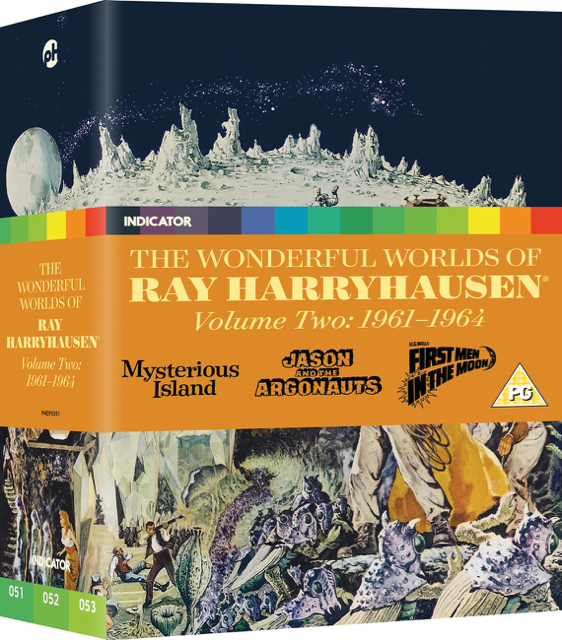 Hmm, so that leaves Mysterious Island and First Men In the Moon for the third set - Jason is also already out on UK BD. Unless I'm missing something? Assuming no duplication with previous UK Blu-Ray releases, I would have thought Gwangi is the most likely contender - unless it's a selection of short films. Short films makes sense. Heck, maybe the Puppetoons. ...and it can be preordered here. What A Disgrace wrote: If Indicator managed to get a deal with Warner Bros., a volume 3 of the Wonderful Worlds of Ray Harryhausen (which would really be a volume 4, since we started with Sinbad) could contain One Million Years BC, Valley of Gwangi and Clash of the Titans, all owned by Warner. One Million Years BC was released on Blu-ray by Studio Canal in the UK and by Kino in the US (licensed from Fox). It does not appear that Warner owns the title. ...and It Came From Beneath the Sea, 20 Million Miles to Earth and The 3 Worlds of Gulliver. For some reason, Harryhausen number 1 is listed as being released on Friday on Amazon, instead of today. What A Disgrace wrote: For some reason, Harryhausen number 1 is listed as being released on Friday on Amazon, instead of today. October 2, in fact - there was a delay in production of the boxes. The specs of Indicator Bluray of Jason and the argonauts vs. the US bluray, seem exactly the same to the last byte. Didn't Indicator do their own encoding? Something tells me that caps-a-holic have made a mistake and posted the same specs for both. The Jason disc is the same as HMV disc, which I guess is just a port of the U.S disc. Similar to Annie Hall and Manhattan in Arrow's Woody Allen collection, Indicator lobbied to include Jason in the box for a more complete package to compare with Vol.1, and to write about it in the booklet, but it will remain box-set exclusive. It doesn't seem to have been mentioned here, but it was certainly publicised elsewhere (I can think of at least three places, including Blu-ray.com and the official Indicator Facebook page) that Powerhouse was only able to include Jason and the Argonauts if it was the existing Sony disc. And Apperson is entirely correct about the parallels with the Annie Hall and Manhattan situation. Basically, if a title is currently in print on BD in the same territory, major studios don't seem to like boutique labels producing what will inevitably be perceived as rival editions, especially if they attempt to improve on them (Arrow, for instance, would certainly have fixed the subtitle gag in Annie Hall if they'd been given the option). So it's the existing disc or nothing at all, take it or leave it. Although fortunately the existing Sony edition of Jason is excellent - the only minor annoyance being that two of its extras were also included in the Indicator Sinbad box (because at the time they hadn't managed to secure Jason), but there's not a lot that can be done about that. To mark what would have been Ray Harryhausen's 98th birthday, Powerhouse is offering all three Indicator Harryhausen boxes at a combined discount - the offer expiring at midnight on Sunday (UK time) or when they run out of The Sinbad Trilogy, whichever's soonest. Thank you for the heads up on the Harryhausen Birthday Special, MichaelB. I was waiting to purchase these sets (and The Sinbad Trilogy) from Amazon. This definitely saved me some $$$.